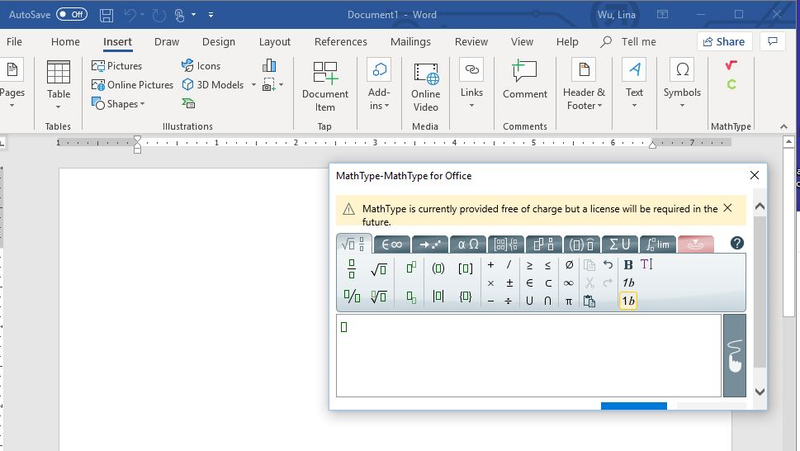 It is now possible, at no extra cost, to embed accessible math equations within Microsoft Office (Word, PowerPoint, Excel), Google Docs, Mac Office Software (Pages, Key Note), and D2L using MathType add-in. Creating equations using MathType, puts them into the accessible format MathML that can render directly in web browsers. When equations are in MathML they can be read correctly by a screen reader such as Jaws, Read Aloud, and Voice Over. The equations can also then be converted to Nemeth Braille on a Braille Display that is typically connected to the computer via USB or Bluetooth. The math is visible in a notation that a computer generates from fonts in its character set. It is not an image file. Unfortunately, many current applications use image files for displaying equations. While it is possible to add "Alt text" to these images, this does not provide access to manipulate, edit or solve it. A screen reader can read the equation and sequence through it character by character. A Braille display can present it in standard Nemeth or UEB Braille. The user can independently edit and solve it. The user can create math in the same format. At MSU, this will enable students to give their work back to the professor. The math is searchable. This enables users to navigate documents and find the equations or parts of equations needed. This will also enable researchers to find equations online. Artificial Intelligence will have access to the math which will enable unlimited ways for users to learn and use these equations. MathML (Mathematical Markup Language) is an industry standard adopted by the W3C as the approved way of expressing math on the web. MathML is a markup language written in XML syntax. It describes structure and content of mathematical notation. The RCPD has been using MathML in XML or XHTML documents for several years to make accessible math for our students with disabilities. MathML is a universal format for math that is easily convertible into visible, audible, tactile and machine-readable forms. MathType is currently a free add-in that can be utilized in Microsoft Word, Excel, and PowerPoint. While MS Word provides some math creation tools built in, MathType is the preferred method as it offers greater accessibility. 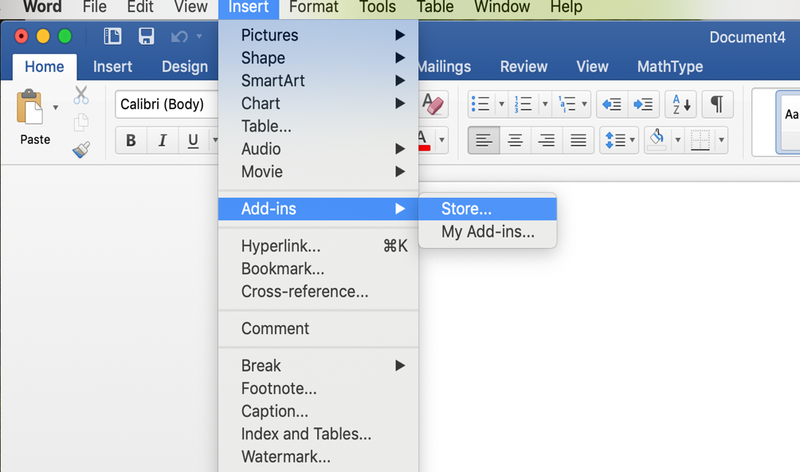 To install MathType go to the Insert tab in Word and select Get Add-ins in the Add-ins group. Once installed this MathType option will appear in your Insert menu. You can select it and enter math equations in a floating dialog box with many symbols and typed text or by handwriting equations. then search for MathType add-in in the search box. To insert an equation using MathType go to insert tab and select Math icon to open MathType Window. You can then type the equation or handwrite it. Select MathType as preferred equation editor by going to Pages menu, preferences, then in Equation preferences selecting to use MathType. To insert an equation, go to insert. Equations, then type equation in dialog box that appears. When finished close box, and equation will appear in Pages’ document. 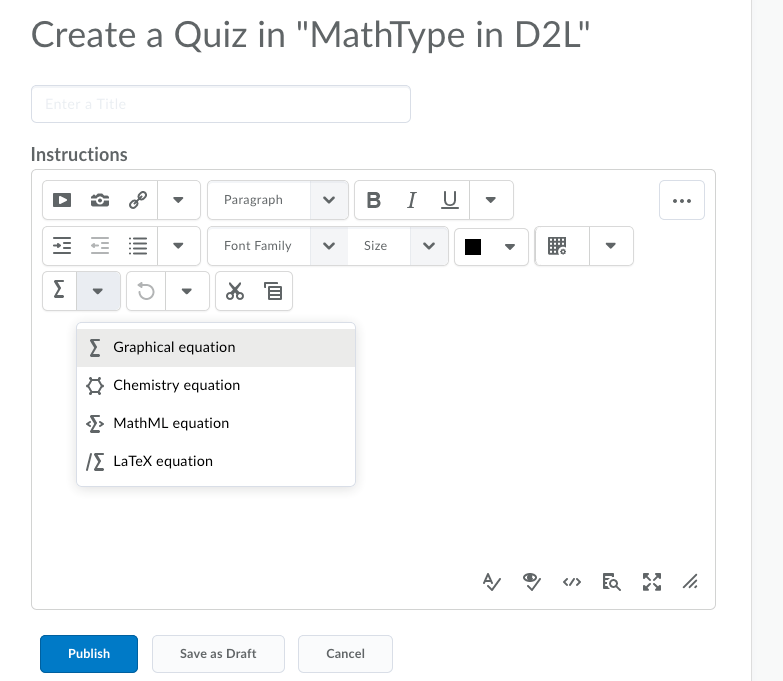 Use MathType when inserting math equations in D2L. When creating content hit the "Show All Components" button. Then in the drop-down equation menu, select Graphical equation. A MathType window will then appear to type or handwrite the equation. Also see the Mathematical Expressions & MathML in D2L Tutorial. More information about how to use MathType is found at the following link, https://docs.wiris.com/en/mathtype/start. LaTeX is a math markup language familiar to many in the science and math community, but unfortunately is not currently supported by screen reader technology. You can use the LaTeX input in MS Word to embed MathM as follows. Using this newly available process for creating math in your handouts will enable many students with disabilities to access homework independently. It also saves many hours for RCPD staff who currently rewrite every equation for them. Getting MathML to render in web browsers is very complicated. However, many popular browsers have MathML support built-in. For example, Firefox and Safari have MathML support built-in. Internet Explorer doesn't have support for MathML built-in, but can use the Math Player plugin from Design Science to enable support. Unfortunately, MathML is not supported in Microsoft Edge and Chrome. Using MathJax is an option that should make embedded MathML display correctly in browsers that support CSS2.1. D2L automatically uses MathJax. While using MathType to create MathML is a "giant leap" in accessibility, it does not satisfy all of the goals to create accessible math. A better way to deliver accessible math is through web pages as stated by W3C. https://www.w3.org/Math/. The MSU "Enhancing the Accessibility of Mathematics and Symbolic Content" project is currently developing a tool to easily embed MathML in online XHTML documents and web pages. This is the ultimate and universal design way to experience math with many potential learning enhancements. http://www.msumathonline.com/. Tutorial prepared by MSU Resource Center for Persons with Disabilities (RCPD). Microsoft Word (.docx) version which will correctly render the MathML.